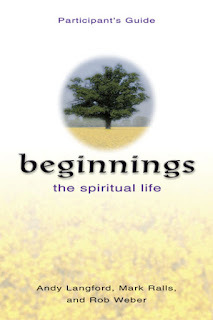 The first of our 8 Wednesday group sessions of Beginnings- The Spiritual Life began last night at A Moveable Feast, 6:30- 8:15 p.m., 9341 Katy Freeway in Houston. Our next session is Monday, March 30 (instead of next Wed.), FYI. Guests are welcome to come and preview. The food is great (and free) and then there's a talk followed by small groups. The goal of our group time is simply put, to begin a journey led by the Spirit, the Guide. Just as Jesus was led by the Spirit into the wilderness (Matthew 4:1), so we are invited to start a spiritual journey under the leadership of Holy Spirit. Each part of the pilgrimage is toward God and with God. Habits, practices, movements are offered and available for the taking. The first "habit of the heart" is willingness to let go. What are the expectations of God, Holy Spirit, spiritual life, that I need to release in order to start the new that's just ahead? What of my own stuff do I need to unburden to receive this newness, the life of the Holy Spirit? For the daily exercise, be aware each day of the wind. Do something that will help you actually be attentive to the power and life of the wind (spirit). Come Holy Wind and Breath, Come Holy Spirit. Hover over and around and within. Make new ways out of the old. Bring to life, refresh, awaken, move us in love, heal us in your goodness, bless us with the willingness to venture, begin, learn- every day. Really, Are We All that Different?